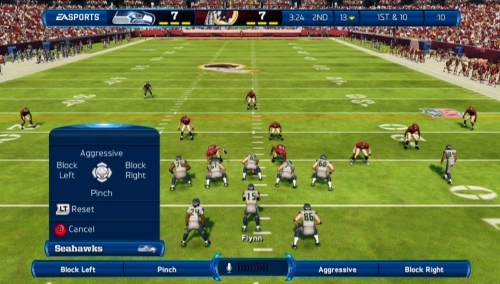 While EA Sports has mainly touted the ability to complete audibles, assign hot routes, and call timeouts using Kinect for Xbox 360 there is a huge number of actions that can be taken through voice commands. Check out the full list of them here through the images pulled from the demo. In total there are 128 different commands that can be given between the offensive and defensive sides of the ball affecting the entire team, single unit, or individuals. Early response towards the Kinect functionality has been mixed regarding both usefulness and responsiveness. While I need to spend more time with it I like having the ability to utilize the voice commands in a supplemental fashion but it doesn’t seem to be picking them up consistently enough. Some are responsive on the first time when called out while others take multiple attempts and sometimes never get completed. The Kinect implementation is good for accessibility purposes as well but there just isn’t enough time prior to the snap to make many adjustments especially when it’s not responding immediately to the commands given.